Gionee, current record holder for the world's slimmest smartphone has just been beaten by a fellow Chinese manufacturer. Oppo's R5, the successor to the Asia-only R3, comes in at just 4.85mm thick, thus beating the 5.15mm-thick Elife S5.1 from Gionee. And besides being impossibly thin, the R5 has pretty good specs as well. The frame of the phone is made of 3D-welded aluminum alloy. The frame has been hand-polished and measures just 4mm thick. The other measurements are 148.9 x 74.5mm and the weight is 155g. 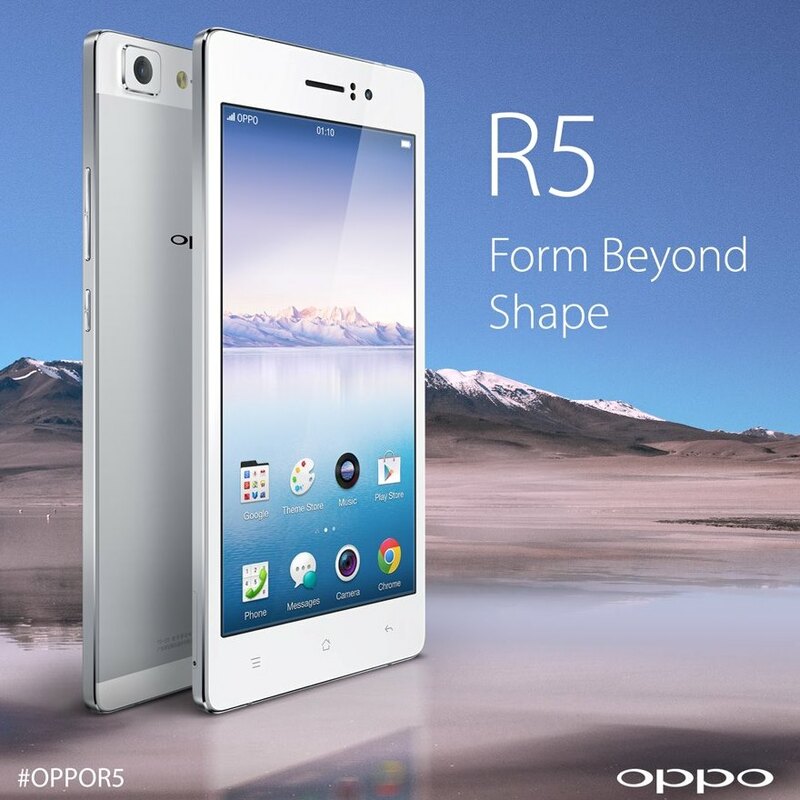 The Oppo R5 has a 5.2" AMOLED screen of 1080p resolution (423ppi). The company is promising the best brightness, lowest reflectivity and highly accurate colors. It's powered by Snapdragon 615, Qualcomm's mid-range octa-core chipset. It features an octa-core Cortex-A53 processor at 1.5GHz, which is paired with an Adreno 405 GPU and 2GB RAM. Oppo has created a special cooling element made from liquid-metal and phase-change materials to take heat away from the chipset. The R5 will launch with Android 4.4-based Color OS 2.0. The back camera features the 13MP Sony IMX214 sensor and an f/2.0 aperture, while the front camera is a 5MP shooter. As you can see though, the back camera sticks out quite a bit. Anyway, it can record 2160p video at 30fps and 1080p@60fps, plus a 120fps slow-motion mode at 720p. Despite being so thin, the Oppo R5 packs a 2,000mAh Li-Polymer battery. The phone includes OPPO’s VOOC mini rapid charging system and claims a 30-minute charge will provide 75% battery, and a five-minute charge allows for a two-hour call. Connectivity starts off at 2G GPRS and goes up to TDD/FDD LTE. There's also Wi-Fi a/b/g/n, Bluetooth 4.0. The R5 is so thin that it doesn’t have a regular 3.5 mm headphone port. Users will have to rely on their Bluetooth earphones or connect via a microUSB to audio jack adapter. Good news is the adapter is included in the retail package. The R5 is due to hit the global market this December. It'll come in silver, gold and grey with an off-contract price of $500.